MOSCOW, the Russian Federation, (BulgarianMilitary.com) – A source, engaged in the Russian defense-industry, announced that the Russian next-generation silo-based intercontinental ballistic missile – RS-28 Sarmat ICBM, would enter serial production in 2021, observing the set deadlines for that. The Russian state news agency TASS reported his statement earlier today, learned BulgarianMilitary.com. 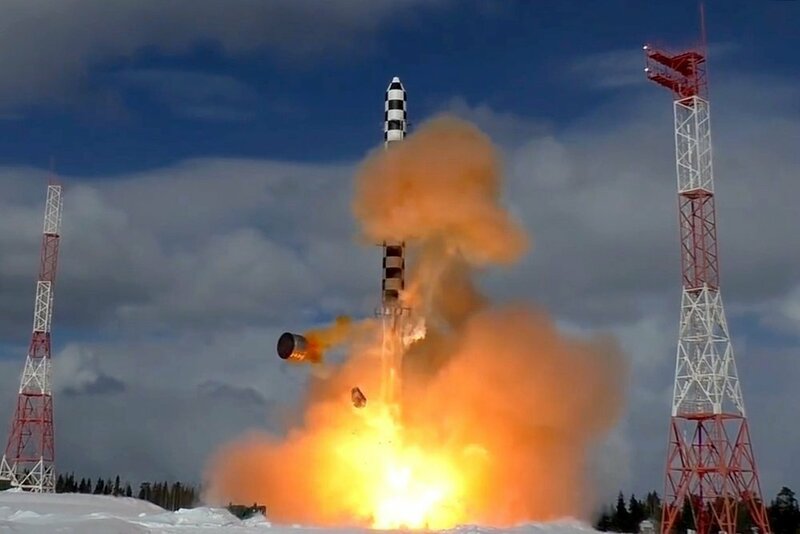 The source of the state-run news agency also reveals that the Sarmat missile is scheduled to complete its flight trials and then to be authorized for service within the same time framework, which confirms the Defence Ministry statement, made in July, that the RS-28 is very likely to go operational within the expected deadlines. The missiles serial production will begin at the Krasnoyarsk-based machine-building plant, which is the former Soviet Union’s leading manufacturer of missiles for submarines. The first regiment, which will be armed with the super-heavy thermonuclear-armed RS-28 Sarmat, is expected to enter duty in the Russian Strategic Rocket Forces later in 2021. According to the reports this will be a regiment of the 62nd Missile Division, which currently is deployed in Uzhur, part of the 33rd Guards Missile Army, headquartered in Omsk in southwestern Siberia. Initially, it will receive two silo-based RS-28 ICBMs, with four more expected to be deployed at a later stage, not stated when. In total, Russia will deploy seven regiments, consisting of six RS-28 missiles each, as well as one ten-missile regiment for a total amount of 46 RS-28s. The regiments will be split up between two missile divisions, which are based in Dombarovskiy air base and Uzhur,the Krasnoyarsk territory. As it was announced earlier, the RS-28 first flight test, which will involve the missile’s second- and third-stage engines launching, is scheduled to be held in early 2019. So far, Russia have carried out ejection tests of RS-28 Sarmat, respectively in December 2017, March 2018 and in May 2018, with the last held at the Plesetsk space center, situated in Arkhangelsk region. The RS-28 Sarmat ICBM has been developed at the Makeyev Rocket Design Bureau, in the town of Miass, under a program, aiming the replacement of the Strategic Missile Forces’ aging RS-36M2 Voyevoda ICBMs.